Memo to Al Sharpton & Friends: is it really wise to bring up the issue of "tax returns" during your show? After all, the Reverend's own operations were RAIDED BY THE IRS in 2007 and as of late 2011, his organization still owed the feds $2.6 million. The National Action Network's accounting has been described as "in disarray" and "a mess". And yet that hasn't stopped the MSNBC host from turning his syndicated radio show into a Mitt Romney-bashfest this week over that very issue. Apparently Al believes his listeners are too ignorant to see the screaming hypocrisy. During yesterday's program, fellow MSNBC talker and regular guest Melissa Harris-Perry slammed the GOP primary candidate, calling him "unbelievably dishonest" regarding his finances. This is part of a broader line of attack undertaken by Newt Gingrich and Obama-supporting Democrats. MELISSA HARRIS-PERRY (19:27) (MSNBC, SHARPTON GUEST): Romney’s not presenting himself in a way that is moderate, he’s just so unbelievably dishonest about his own record, so unbelievably dishonest about his own finances, so unbelievably unbelievable that I think it’s just it’s almost impossible to imagine how he’s going to pull together a reasonable coalition to win in 2012. 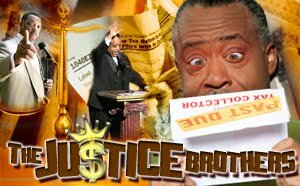 And from what we've heard so far of today's Sharpton show, the Mitt- tax return theme was repeatedly used and abused by Al's Pals. Given the Reverend's long history of trouble, will anyone mention the obvious irony?